TRAFFIC ALERT: The Baum Blvd Bridge and Baum Blvd opened to traffic Wednesday, June 23, 2016. Lane restrictions will remain through next month due to additional work to be performed. 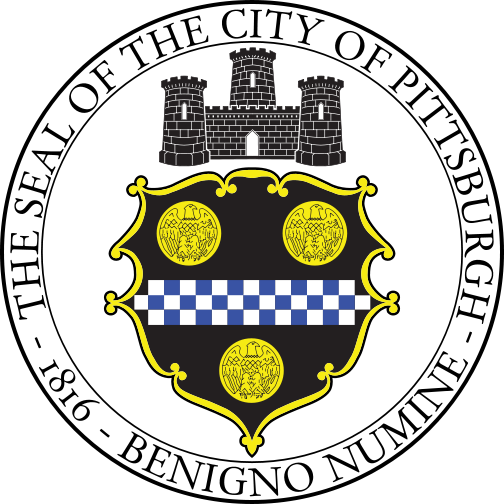 PennDOT District 11 announces the beginning of a $12.34M improvement project on Route 380 (Bigelow Blvd, Baum Blvd, North Craig Street and the Bloomfield Bridge) in the City of Pittsburgh, Allegheny County, starting Tuesday, June 30, 2015, weather permitting. The project will conclude in August of 2016. This project involves the full depth reconstruction of SR 0400 (Bigelow Blvd., N. Craig St. and Baum Blvd.) from the ramp to Bloomfield Bridge northbound (Ramp F) to the Baum Blvd. Bridge over the PAT Busway and the mill and overlay of Baum Blvd. from that bridge to Moorewood Ave. Also included is the reconstruction of Ramp F, as well as the on and off ramps between Bigelow Blvd. and Bloomfield Bridge. Several ADA sidewalk ramps will be reconstructed at the instersection within the project limits and new signals will be installed. Construction during 2016 includes the Baum Blvd. bridge deck replacement, with both directions detoured via Baum to Liberty to Bloomfield Bridge to Bigelow and vice versa. In addition, Baum Blvd. from the bridge to Moorewood Ave, will be milled and overlaid, with 1 lane in each direction maintained adjacent to the work zone. New signals will be installed at the Baum Blvd. intersections with Millvale Ave. and Moorewood Ave. The Baum Boulevard bridge was rebuilt in 1973. In 2016, the 43 year old bridge will receive a full bridge deck replacement as part of the Bigelow/Baum Boulevard Reconstruction Project. Did you know there used to be an amusement park called Luna Park at North Craig and Baum? Reconstruction of WB Bigelow from the start work to North Craig St., one lane of traffic in each direction will be maintainted on the exisitng EB pavement. Also, Ramp F and the on and off ramps between Bigelow Blvd. and Bloomfield Bridge will be closed for reconstruction. Traffic will be detoured via SR 0400 and Liberty Ave. for these closures. 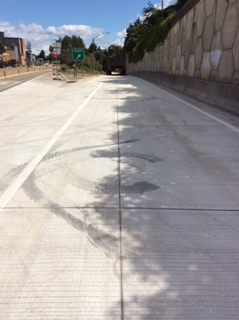 Will be the mirror, one lane each way on the new WB pavement while the EB side is reconstructed. New signals at the Bigelow/Bloomfield and Bigelow/N. Craig intersections will be installed. 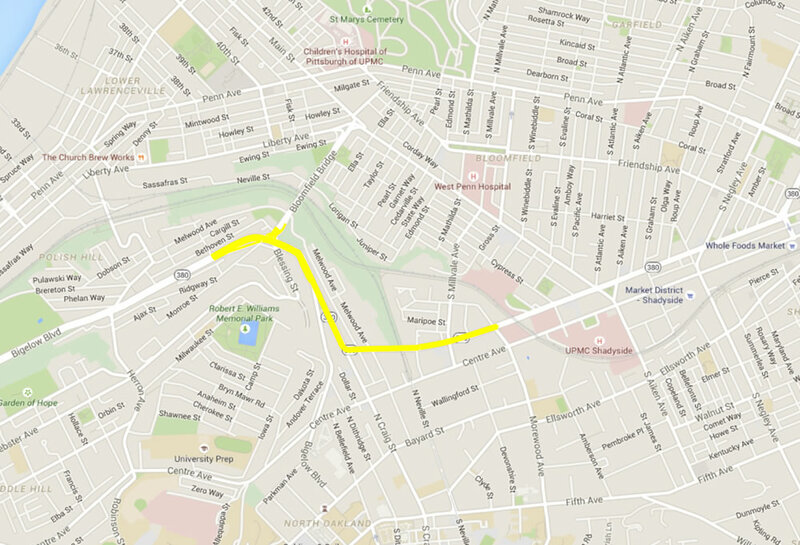 Reconstruction of North Craig from its intersection with Bigelow to its intersection with Baum, then Baum Blvd. 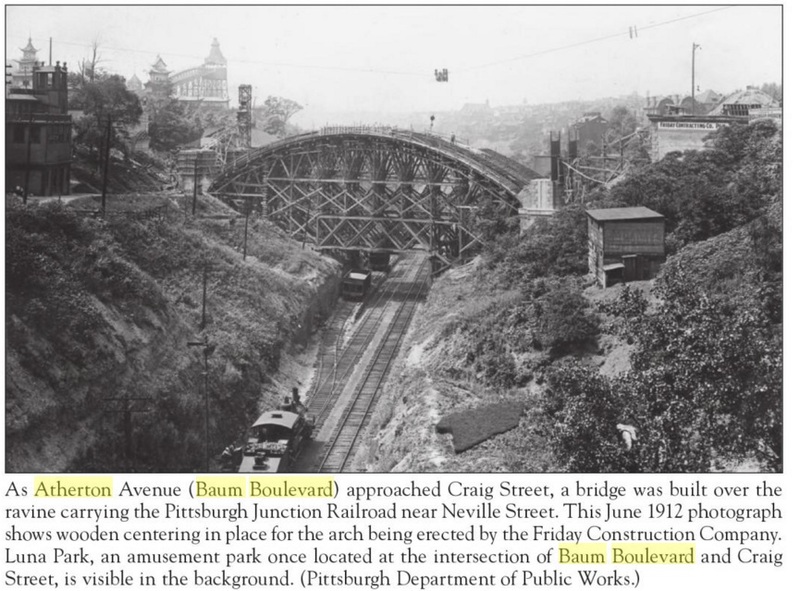 reconstruction from N. Craig to the bridge over the PAT Busway. During Phase 3, one lane of SR 0400 EB traffic will be maintained adjacent to the work zone, SR 0400 WB will be detoured via Baum Blvd. to Liberty Ave. to Bloomfield Bridge. New signals will be installed at the N. Craig Street/Baum Blvd. and Baum Blvd/Melwood Ave. intersections. One lane on the respective outside lane while the median and barrier are reconstructed. All roadways will be fully opened by December 21, 2015 and remain that way until February 28, 2016. PennDOT District 11 is announcing reconstruction work at the intersection of Route 380 (Baum Boulevard) and Gold Way in the City of Pittsburgh, will begin Friday night, June 3 weather permitting. Reconstruction activities will occur at the Route 380 intersection with Gold Way from 6 p.m. Friday night continuously through 6 a.m. Monday, June 6. The intersection will close and traffic will be detoured. Work occurring in 2016 on this $12.34 million project includes the deck replacement of the Baum Boulevard Bridge and the milling and resurfacing of Baum Boulevard between the bridge and Morewood Avenue. To help keep motorists informed as work on the Route 380 project continues PennDOT is creating an email distribution list for Route 380 traffic advisories and construction updates. Enroll by sending email addresses to stcowan@pa.gov and writing “Subscribe – Route 380 Bigelow-Baum” in the subject line. PennDOT District 11 is announcing the closure of the Baum Boulevard (Route 380) between Gold Way and Melwood Avenue in the City of Pittsburgh, Allegheny County, will begin on Tuesday, May 10 weather permitting. Baum Boulevard will close to traffic between Gold Way and Melwood Avenue beginning at approximately 12:01 a.m. Monday continuously through Thursday, June 23 as crews from Swank Construction Company, LLC begin roadway improvement work. This work will extend the Baum Boulevard closure from Enfield Street to Gold Way, as work on the Baum Boulevard Bridge replacement continues. Additionally, motorists on Melwood Avenue can access North Craig Street via Centre Avenue. Motorists using both Gold Way and Melwood Avenue will be able to cross over Baum Boulevard during the work. PennDOT District 11 is announcing a lane restriction on Route 380 in the City of Pittsburgh, Allegheny County, will continue next week Monday through Friday, April 25-29 weather permitting. A short-term single-lane restriction will occur as needed on Route 380 in each direction between the Bigelow Boulevard and Herron Avenue intersection and the North Craig Street and Baum Boulevard intersection from 10 a.m. to 3 p.m. each day. Crews will conduct signal pole installation though Friday, April 29. PennDOT District 11 is announcing a lane restriction on Route 380 in the City of Pittsburgh, Allegheny County, will continue Tuesday, April 19 weather permitting. PennDOT District 11 is announcing a lane restriction on Route 380 in the City of Pittsburgh, Allegheny County, will occur Thursday through Saturday, April 14-16 weather permitting. A short-term single-lane restriction will occur as needed on Route 380 in each direction between the Bigelow Boulevard and Herron Avenue intersection and the North Craig Street and Baum Boulevard intersection from 9 a.m. to 3 p.m. each day. Crews will conduct signal pole installation. PennDOT District 11 is announcing the closure of the Baum Boulevard Bridge (Route 380) in the City of Pittsburgh, Allegheny County, will begin on Monday night, April 4 weather permitting. The Baum Boulevard Bridge, located between Melwood Avenue and Enfield Street, will be closed to traffic for 80 consecutive days beginning at 7 p.m. Monday night. All traffic will be detoured. PennDOT District 11 is announcing overnight single-lane restrictions on the Baum Boulevard Bridge (Route 380) in the City of Pittsburgh, Allegheny County, will begin on Monday night, February 29 weather permitting. Overnight single-lane closures in each direction on the Baum Boulevard Bridge will occur weeknights from 6 p.m. to 7 a.m. through Monday night, March 14. Crews from Swank Construction Company, LLC will conduct preparatory work prior to the long-term closure of the bridge. Work occurring in 2016 on this $12.24 million project includes the deck replacement of the Baum Boulevard Bridge and the milling and resurfacing of Baum Boulevard between the bridge and Morewood Avenue. Pittsburgh – PennDOT District 11 is announcing reconstruction work at various intersections on Route 380 (Bigelow Boulevard, North Craig Street, Baum Boulevard) in the City of Pittsburgh, will occur Friday through Monday, November 13-16 weather permitting. Additionally, reconstruction work will continue at the intersection of Route 380 (Bigelow Boulevard) and Blessing Street. Single-lane alternating traffic will occur on Blessing Street at the intersection with Bigelow Boulevard. However, Ridgeway Street will close to traffic at the intersection with Blessing Street. Local traffic will take Bigelow Boulevard to Herron Avenue to Ridgway Street. This $12.24 million roadway reconstruction project of Route 380 (Baum Boulevard/North Craig Street/Bigelow Boulevard), between Morewood Avenue and Herron Avenue, includes full depth reconstruction from the eastbound off-ramp of the Bloomfield Bridge to the Baum Avenue Bridge over the PAT Busway, reconstruction of the Baum Avenue bridge deck and milling and resurfacing of Baum Avenue from the bridge to Morewood Avenue. Additional work includes reconstruction of ADA curb cut ramps, traffic signal upgrades and pavement reconstruction at the Bloomfield Bridge. The overall project will conclude in August of 2016. PennDOT District 11 is announcing reconstruction work at various intersections on Route 380 (Bigelow Boulevard, North Craig Street, Baum Boulevard) in the City of Pittsburgh, will occur Friday through Monday, November 6-9 weather permitting. Traffic will be detoured at these intersections. PennDOT District 11 is announcing weekend closures at the intersection of Route 380 (Bigelow Boulevard) and Blessing Street and the intersection of Route 380 (North Craig Street) and Bigelow Boulevard in the City of Pittsburgh, Allegheny County, will occur Friday, October 30 through Monday, November 2 weather permitting. Additionally, reconstruction work will occur at the intersection of Route 380 (Bigelow Boulevard) and Blessing Street from 6 p.m. Friday continuously through 7 a.m. Monday morning. All traffic will be detoured. PennDOT District 11 is announcing a change of the starting location of the westbound closure of Route 380 in the City of Pittsburgh, Allegheny County, will begin Friday, September 4 weather permitting. Beginning at approximately noon on Friday, westbound Route 380 (Baum Boulevard/North Craig Street/Bigelow Boulevard) will close to traffic from the intersection of Millvale Avenue and Baum Boulevard to the intersection of the Bloomfield Bridge and Bigelow Boulevard. The current closure begins at Melwood Avenue. The long-term closure is currently occurring around-the-clock for 91 consecutive days. All westbound traffic will be detoured. PennDOT District 11 is announcing a long-term closure of westbound Route 380 in the City of Pittsburgh, Allegheny County, will begin on Thursday, August 27 weather permitting. Beginning at approximately 4 a.m. on Thursday, westbound Route 380 (Baum Boulevard/North Craig Street) will close to traffic from the intersection of Melwood Avenue and Baum Boulevard to the intersection of North Craig Street and Bigelow Boulevard. The long-term closure will occur around-the-clock for 91 consecutive days. All westbound traffic will be detoured. Motorists on Bigelow Boulevard at the intersection with North Craig Street can continue westbound on Bigelow Boulevard. Additionally, eastbound traffic on Route 380 will be restricted to a single-lane from the Bloomfield Bridge to Melwood Avenue during the westbound closure. Crews will conduct roadway reconstruction. PennDOT District 11 is announcing the northbound Bloomfield Bridge in the City of Pittsburgh, Allegheny County, will close to traffic beginning Monday, August 24, weather permitting. Beginning at 4 a.m. on Monday, a 26 consecutive day, around-the-clock closure of northbound Bloomfield Bridge will occur. The bridge will be closed to northbound traffic at Bigelow Boulevard. Traffic will be detoured. PennDOT District 11 is announcing the southbound Bloomfield Bridge in the City of Pittsburgh, Allegheny County, has reopened to traffic. The bridge was closed in the southbound direction for 23 consecutive days for concrete roadway repairs and drainage improvements. 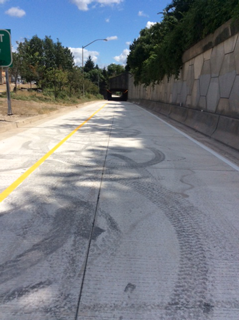 The ramp from Bigelow Blvd to the Bloomfield Bridge is NOW OPEN. The work on the south end of the Bloomfield Bridge is scheduled to be completed by August 21st in time for Little Italy Days. That would remove all current detours that use Liberty Ave. The work on Blessing Street will be completed during 2 weekends and one lane of alternating traffic will be maintained. Beginning at 2 a.m. on Tuesday, June 30 the ramp from eastbound (outbound) Bigelow Boulevard to the Bloomfield Bridge will close to traffic for 44 consecutive days for roadway reconstruction. Traffic will be detoured. 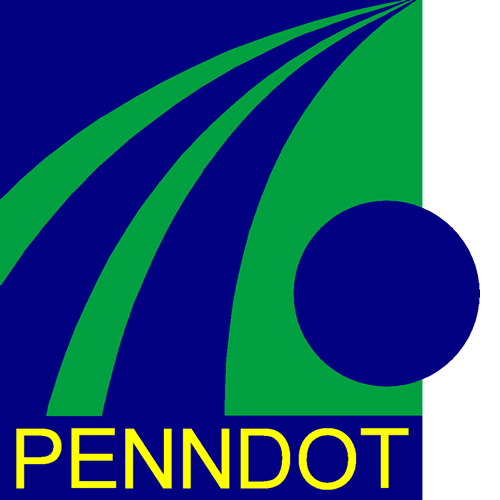 The Pennsylvania Department of Transportation, Engineering District 11-0, invites the public to attend a public display of plan for the reconstruction of SR 0400, Section A38, Baum Boulevard between Findland Street and Morewood Avenue. The project, located in the City of Pittsburgh, Allgeheny County, PA includes full depth reconstruction from the Eastbound off-ramp to Bloomfield Bridge to the Baum Avenue Bridge over the Port Authority of Allegheny County Busway, reconstruction of the bridge deck and mill and overlay of Baum Boulevard from the bridge to Morewood Avenue. It also includes reconstruction of ADA sidewalk ramps and traffic signal upgrades within the project limits and reconstruction of the pavement of the underpass ramp to the Bloomfield Bridge. The purpose of the public meeting is to present the construction schedule and traffic patterns during construction. A brief presentation will be given followed by an open house format. PennDOT and their representatives will be available for discussion and to answer questions. Everyone who is interested in the project is invited to attend anytime during the above meeting hours. In compliance with the Americans with Disabilities ACT of 1990 (ADA), the meeting has been scheduled at a facility that is accessible to individuals who have disabilities. Any person having special needs or require special aids is requested to contact Mr. Doug Seeley, Project Manager at (412) 429-4883 prior to the meeting so that special accommodations can be made. Swank Construction Company, LLC, Gibson Thomas Engineering Co., Inc.
About 60 residents crowded into a first-floor conference room at the Courtyard Marriott on Liberty Avenue on Tuesday night to learn more about a construction project along Route 380 that will rebuild a major thoroughfare and force detours for thousands of commuters in Bloomfield, Oakland and Polish Hill. PennDOT District 11 officials conducted a public meeting about the $12.34 million road reconstruction project for the corridor of Baum Boulevard, Bigelow Boulevard and the Bloomfield Bridge between Morewood and Herron avenues. Restrictions and detours will be in effect this summer and next as the project commences. Construction is anticipated to begin at the end of June and wrap up in August of 2016.